The introduction of wireless in-flight entertainment (W-IFE) has revolutionised the in-flight entertainment industry and driven a seemingly unlikely collaboration between major airlines, communications companies and tech giants such as Samsung. Other main industry players reported to be involved actively in this transformation are Bluebox Avionics Ltd, Gogo Inc., Inflight Dublin, Ltd, Lufthansa Systems GmbH, Panasonic Corporation, SITA OnAir, Thales Group S.A., Zodiac Aerospace SA, Rockwell Collins Inc., and BAE Systems PLC. 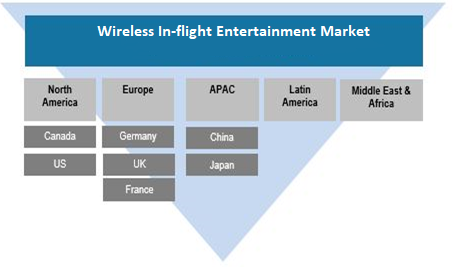 The international Wireless in-flight entertainment market size was estimated to be USD 1,012.2 million in 2017 and is projected to grow at a 15.4% CAGR till 2026. This growth could be attributed to developments in the wireless connectivity industry and the subsequent popularity of the BYOD (Bring your own device) trend among the consumer base. Wireless in-flight entertainment is the latest development in-flight entertainment, allowing passengers to stream media content to embedded media interface hardware or to their personal devices from a server on the aircraft. Rising preference for the use of personal electronic devices has further favoured the advent of wireless in-flight entertainment and connectivity services. These developments are beneficial for the airlines as well. Trends such as the BYOD have given airlines the opportunity to get rid of old backseat in-flight entertainment systems. In doing so, airlines can substantially reduce airplane weight and make savings on fuel. The regulatory and political landscape within the aircraft industry has been a key determinant of growth as the former is responsible for either allowing or prohibiting operators from providing such services. In the United States, for instance, the federal communications commission in partnership with the federal aviation authority allowed airlines to incorporate (PED) portable electronic device infrastructure into their airplanes on the condition that all implementation directives were followed. This change in policy has created an opportunity for new revolutionary developments in the US wireless in-flight entertainment industry. Due to the popular response towards wireless in-flight entertainment among people in the developing economies, Asia Pacific region will witness the maximum growth during 2017 to 2026 as projected by the report by Polaris Market Research. The incorporation of real-time wireless in-flight connectivity into in-flight entertainment systems, has opened numerous opportunities for growth. Passengers can now look forward to live-content, live streaming and access to another video on demand portals. In countries such as India however, the prohibition of personal electronic devices has hindered growth. The market is categorized by product type, fitment type, aircraft type, hardware, and technology. The product segment consists of various types embedded IFE, overhead IFE, portable IFE, and wireless IFE. The fitment segment is characterized by line fit and retrofit. The retrofit market segment of wireless in-flight entertainment is estimated to record exceptional growth during the forecast period of 2017 to 2026. The companies currently creating software for in-flight wireless entertainment systems are expected to expand at a dramatic rate in response to consumer demand for new innovations in this sector. Major content providers such as Stellar Entertainment and Global Eagle Entertainment Inc. are also set to enter a period of steady growth. Currently, all airlines are moving to invest in the acquisition of improved broadband and satellite technologies as this will help ensure that they remain profitable in an industry that is highly competitive.